If you are looking for something fun to do one your next vacation, why not visit our tourist attraction cave and go gem mining! We are a vacation spot with plenty to do and explore. Gem mining can be fun and exciting! 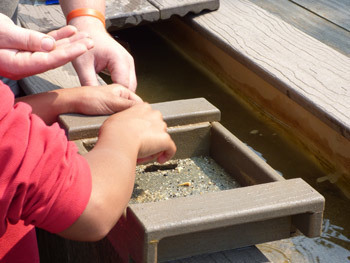 Take your kids and see how they enjoy hunting for gems the entire day. Your kids will talk about our cavern for years and how they were able to hunt for real treasure and take home some beautiful gems. After a long day of exploring we invite your to relax on our picnic ground. Enjoy the beautiful surroundings and reflect on your adventures with your family. We also have RV parking grounds, making us a perfect stop or stay during your road trip! Live like a real archaeologist and come discover the wonders of our remarkable cavern. If you are interested in gem mining, call Crystal Lake Cave in Dubuque, IA for more information.